The Colmar T10000FSCG is a dedicated 360° road-rail crane featuring a telescopic inverted boom allowing it to operate in confined spaces which would be otherwise inaccessible to conventional road-rail cranes. This makes it particularly suited for installation of OLE infrastructure such as portals. On-Rail lifting capacity is up to 12,100kg with a maximum capacity of 14,000kg achieved with the crawler tracks extended for added stability. Colmar have manufactured over 2000 road-rail loaders over 30 years and are the number one manufacturer in Italy and the UK where several contracting companies operate large fleets of road-rail machines. The T10000FSCG crane includes a number of important safety features and is compliant with the AS7502:2016 Road-Rail Vehicles standard. The crane has undergone an extensive development and testing process to ensure compliance with Australian Standards including AS1418 and AS7502. 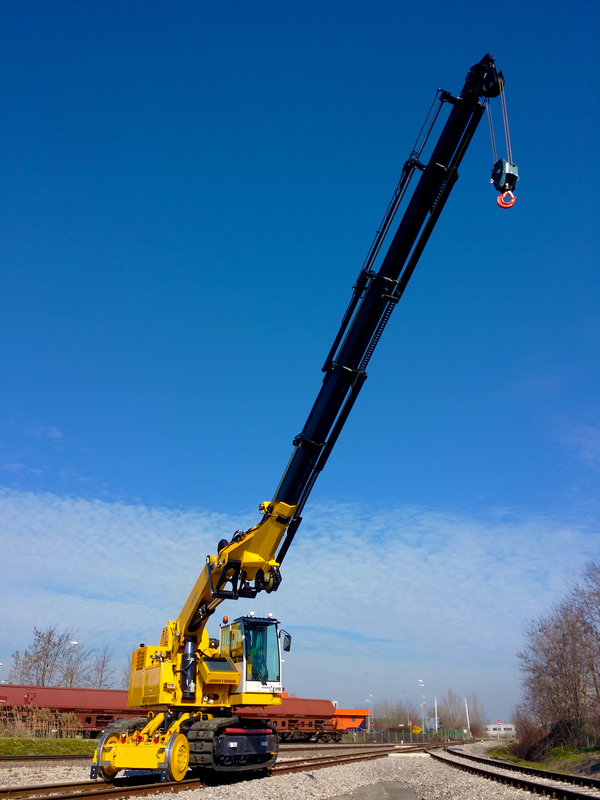 As part of a complete vehicle package, Aries Rail can supply and install vehicle loading cranes from a number of leading crane manufacturers including Palfinger, Hiab, Fassi and Effer. The Aries Hyrail control system is able to communicate with many crane control systems to alter the lifting performance of the crane whilst on-rail either with or without stabiliser legs deployed. For smaller cranes it is often possible to operate at the normal working capacity with no need to de-rate for on-rail use. When larger cranes are required, Aries may install rail clamps or extra-long stabiliser legs to ensure maximum stability is achieved for on-rail lifting. Aries Rail are able to offer a number of options for hyrail conversions of on-road and off-road cranes. 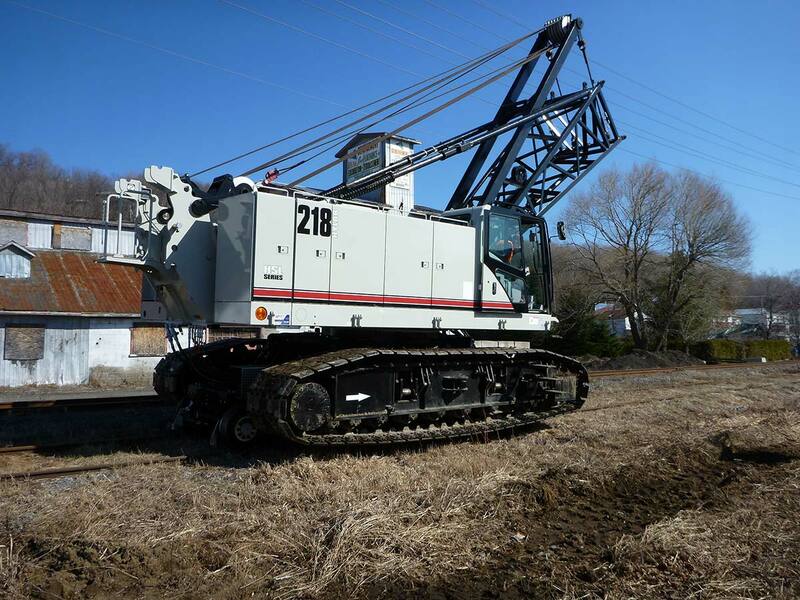 Through partnership with Neotec, one of the world’s premier manufacturers of hydraulic drive systems and axles, Aries can convert a range of cranes to travel to site on-rail such as this Link-Belt crawler machine that was fitted with Neotec drive axles in Canada. 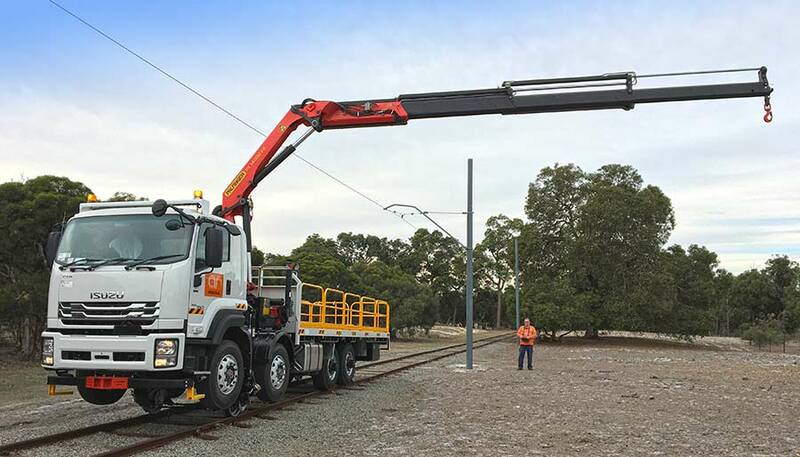 The linkbelt 218 HSL is a 110 ton crane with a transport weight of 45,300kg and may be driven to site on-rail before retracting the rail wheels and disconnecting the quick release hydraulic connections to allow normal operation on-site. Whilst the Link-Belt machine is not available in Australia, Aries can convert a number of similar cranes to road-rail cranes.